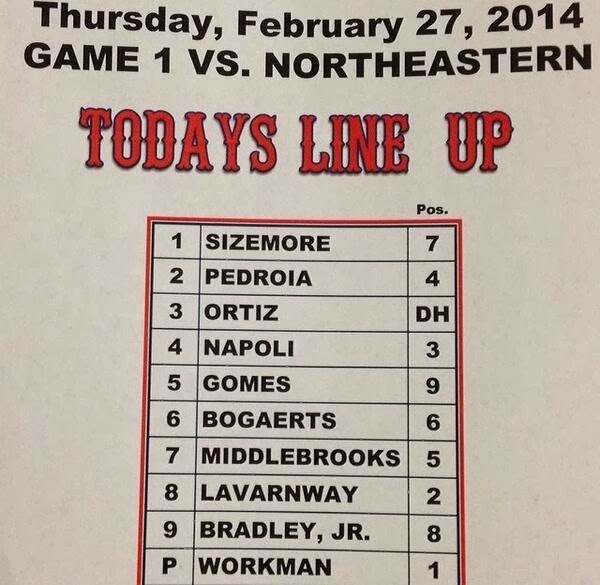 Yesterday the Red Sox opened their Spring Training schedule against Northeastern college as part of a double header. After batting practice David Ortiz stayed on the field to sign autographs, chat with Northeastern players, and pose for photos. who would be pitching later in the game. In the third inning he took the mound. He was really working his curve against Mike Napoli as the first hitter, nearly catching him looking at a two-strike curveball to end the inning but umpire Steve Ward called the pitch outside. Next was Dustin Pedroia who was fanned on a fastball for his first strikeout. Then up came Big Papi, an intimidating sight to say the least, but Mulry got ahead of Big Papi and struck him out swinging at a slider off the plate. Ortiz walked back to the dugout smiling as the crowd of 7,789 at JetBlue Park cheered Mulry. "I was trying to see if I can get a strike to hit or whatever, but he ended up throwing me a nasty breaking ball," Ortiz said. Walking off the mound to the dugout he had a smile on his face a mile wide. "That was a lot of fun," Mulry said. "Usually my curveball is a better pitch, especially with a lefty. But the slider worked. I’ll never forget that inning. ... It’s unreal. I can’t compare anything to facing these guys." One thing you can be sure of, James Mulry's girlfriend was all fired up. “@GoNUbaseball: LHP James Mulry strikes out Dustin Pedroia and David Ortiz in the third inning! #GoNU " OH MAN. That's my boyfriend😍! No matter what happens in the years to come, he can tell the story of a warm Spring day down in Fort Myers to his grandkids. Dreams do come true James Mulry.